What’s the Best Handgun Safe For the Money? 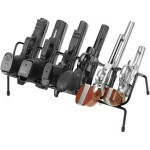 It’s 2014 and gun enthusiasts have never had more choices when it comes to getting the best handgun safe for their money. When spending your hard-earned money on an important and expensive item such as a gun safe, you want to know that you’re getting excellent value which includes good quality, the features you need, and of course a reasonable price tag. 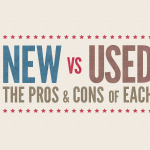 To get the best bang for the buck, look no further than one of these two options. Sure, there are cheaper safes and higher quality safes but these models hit the sweet spot when it comes to quality, features, and price. While it may not look as high-tech as some of the fancy biometric models, the SentrySafe QAP1E is the top handgun safe your money can buy. It has a sleek shape perfect to keep by your bedside, in your nightstand or car, or practically any other place where you’d need it at a moment’s notice. 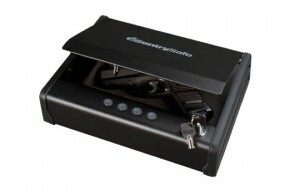 This affordable, made in the USA, quick access pistol safe is very well constructed and is heavier than it looks. What sets this single gun unit apart from others is the compression gas strut that opens the safe quickly, smoothly, and quietly. With some practice (highly recommended) entering the code on its programmable keypad, having your gun in hand within 5 seconds in the dark is entirely possible. This quick access can mean the difference between life and death. Because there is no beeping when a button is pushed, the safe won’t make an intruder aware of your location. 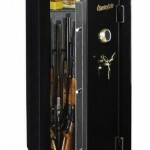 While a gun safe such as this can be defeated by a determined thief (like most safes), that’s not its main purpose. Protecting your family from intruders and keeping your gun out of the hands of curious children is what really matters and that’s why the SentrySafe quick access safe is what we believe to be the best bang for your buck safe. 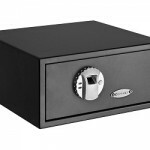 GunVault is a well-known and well-respected brand when it comes to small gun safes. 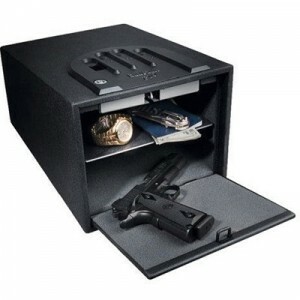 The GV2000C-DLX is a good all-around gun safe and about double the size of the SentrySafe above. You can easily fit two full-size handguns, magazines, and ammo into the safe and still have some room left over for a few pieces of jewelry. 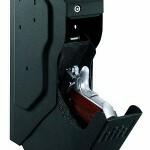 Unique for the price point is a configurable motion sensor which sets off an alarm if the gun safe is jarred or moved. While there have been past issues with GunVault safe batteries draining too fast, this model corrects this by allowing you to plug the safe into the wall and utilizing a battery only for backup purposes. The interior LED light could be brighter and the inside shelf could be stronger, but for the price, the GunVault GV2000C-DLX is still an excellent value.